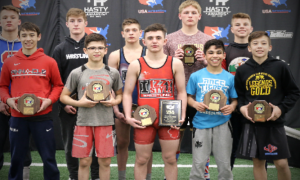 Coming into this weekend’s Junior Greco-Roman World Championships, the keyword surrounding Team USA was “history.” With two returning bronze medalists and four holdovers altogether from 2016, the US entered the festivities in Tampere, Finland with the belief that this wasn’t so much about optimism as it was expectation. History might be made, but delivering on potential served as the squad’s main purpose. After Day 1’s morning session, things are on the right track. Cevion Severado (Xtreme RTC), who is on the 2017 US Junior World Team due to an injury, put together one inspired performance after another to advance to the finals at 50 kilograms. The teammate joining him, young phenom Kamal Bey (Sunkist), dominated his way into the semifinals where he punctuated the morning with a crushing technical fall victory over Per Albin Olofsson (SWE). 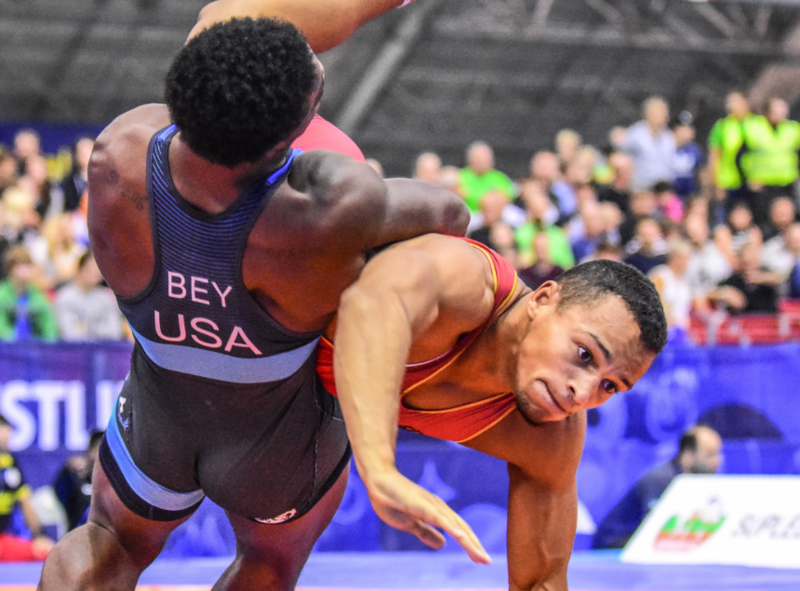 Severado, the greenest of the American athletes on Day 1, needed to show the stage wasn’t too big for him and he got his message across in his first bout against Maksym Vysotskyi (ISR). Severado offered a brisk pace in the early going, snatching up wrists and controlling the inside work. Vysotskiy offered marked resistance and appeared to want to make this a bully-fest. It was a strategy that had no hope of working, because Severado got locked in. The opening period saw the two trade passivity points with the American’s coming first. In the second, Severado turned it up. As he became more assertive in the tie-ups, Vysotskiy was left without many technical options — he couldn’t get inside Severado’s movement and any time he tried to attach to a position, Severado beat him to the punch. Vysotskiy lost his balance coming off of an exchange and Severado immediately capitalized by getting behind for two and a 3-1 lead that soon became 4-1 when Israel challenged and lost. A late takedown by Severado increased the margin to 6-1 and just like that, he was onto the quarters. In the 50 kilogram quarterfinal, Dominic Dudzinski (POL) looked to provide Severado with a more rounded test. So much for that. Right away, Severado clambered inside and wrapped a bodylock, taking Dudzinksi straight to his back for four huge points. He wasn’t done. Following the reset, Dudzinksi reached in and got loose. Severado clamped double underhooks with his back towards the edge, taking the Polish wrestler over for four more and a stunning 8-0 tech, moving him into the semifinals. The unlikely hero had more magic up his sleeve. Taking on Kensuke Shimizu (JPN), who earlier defeated reigning World Champion Vladislav Melnikov (RUS), Severado unleashed in the timeliest of fashions. Trailing 1-0 in the second, Severado used double-underhooks to pull Shimizu over for two points. After they returned to their feet, the Missouri high schooler next scooted behind for two and a 4-1 lead. Severado scored two more and now he was rolling. Shimizu had to up the ante and attempted to do so with a front headlock. Severado dropped his weight, reached in, and countered in full by locking around Shimizu’s body, ushering him to his back. He was holding an 8-1 advantage with time on his side when Shimizu grabbed a late takedown. Inconsequential. Severado with the headline-making 8-3 victory, launches him into the finals this afternoon where he will be duking it out against 2017 Junior Asian Championships winner Poya Soulat Dad Marz (IRI). Bey’s qualification round match-up pitted him versus Korean newcomer Pilkeun Bong. Bey stalked Bong throughout most of the first period, though the Korean did offer suitable playback. Bey tried to zip in arm drags on occasion and was utilizing movement to dictate the tempo. A passivity warning on both rang in before Bong was chipped a second time, giving Bey a point. Shortly after, Bey got in on Bong with a bodylock and arched it over for four to jump ahead 5-0. The beginning of the second saw Bey seize the initiative nearly immediately. He knew he could score. Another bodylock, this one even deeper than the first, was again the weapon of choice. As is custom, Bey arched it through, taking Bong straight to his back and nearly coming away with a pin. The signal for a fall didn’t arrive, but it didn’t have to. Bey moved on just the same with an eye-catching 9-0 tech fall. The round of 16 saw Bey matched up with German Karan Mosebach. Despite owning the early action and controlling the center, it was Bey who was docked for the first (and only) passivity point. After that, he got going in a big way. Jutting in off the ties, Bey blasted Mosebach straight to his back for a bevy of points. Once the German got to his stomach, Bey instantly locked for a reverse lift, elevated, and tossed it over for four. It was 8-1 in a blink. Upon the reset, Bey finished what he started and scooped up another deuce with a takedown to seal this one up 10-1, beginning his morning with two dominating tech’s. 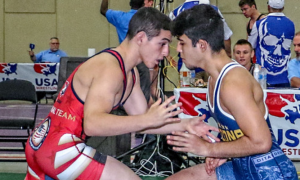 The Olympic Training Center resident got off to another fast start in the quarters against 2016 Cadet World silver medalist Nasir Hasanov (AZE). From a deep clinch, Bey unfurled a four-point bodylock and then followed it up with two off of a turn. Up 6-0, it appeared this one would be over quickly. But Hasanov hung in there, staying alive long enough to capitalize on a Bey miscue in the second period that resulted in a four-point maneuver. With under a minute left, Hasanov attempted a throw Bey deftly countered. Azerbaijan challenged the sequence, believing their guy should be given two for a correct hold. The challenge failed, giving Bey another point and a 7-4 advantage. He skated the rest of the way from there. Bey’s semifinal win over Olofsson was one of those high-scoring affairs he likes. These two got after it right at the whistle, with Bey landing a two-point throw and Oloffson answering back with a reverse arm spin for his own pair of points. At about a minute into the first, Bey got deep on a clinch he used to truck Olofsson down and to his back for four — plus another two on an Olofsson caution — to go up 8-2. This is when things got crazy. The ensuing par terre had Bey reverse gutwrench Oloffson twice with the Swede being given four points of his own, along with another when Bey stepped out. The officials convened and adjusted the (confusing) score to 10-7, essentially negating what appeared to be one of Bey’s two turns. When that chaos simmered down, Bey got back to work with a headlock for two and again, another two on an Oloffson caution. There was a reset before Bey sprinted in on Olofsson with a bodylock for two more and a 14-7 cushion. Remember — this is all in the first period. Knowing by now he could score anytime he reached the body, Bey opened up the second by once again finding a bodylock. He would leave no doubt. Bey hoisted Olofsson up with some air underneath for a whopping five-point throw, ending the match and earning his ticket to the 74 kilogram finals with his third tech of the day. 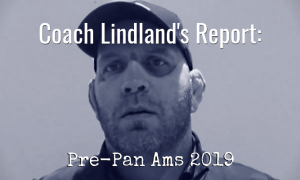 In his quest for gold, he will meet up with 2016 Cadet World Champion Akzhol Makhmudov (KGZ), who got past Turkey’s Oli Osman Erbay 7-1 to advance. 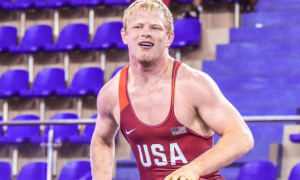 There’s no doubt that Taylor LaMont (60 kg, Sunkist) wanted to improve on his bronze medal from last year’s Worlds, but adding another to his collection will have to do for now. LaMont’s first assignment of the day was not an easy one and he came out of it smelling like roses. In 2015 Cadet World bronze medalist Maksim Nehoda (BLR), he was going up against someone who although presented potentially interesting challenges, ultimately couldn’t keep up with his pace. This one was supposed to be a grind and it lived up to its billing. LaMont and Nehoda greeted each other with purposeful contact and the Utah native started pawing at the ties. Nehoda wasn’t budging, and went back and forth between an upright posture and bending down to meet LaMont’s more fluid station. A little counter-pressure allowed LaMont to lasso a headlock around Nehoda and he corkscrewed the Belarusian to the mat for two. Even with the seal broken, the action still had a tense air hovering over. A passivity on LaMont cut the score in half in the second period and then another came calling not long after, but LaMont still held criteria. A caution-and-two on Nehoda brought LaMont’s lead back up to two — a little breathing room. With under a minute left, LaMont got the jump on Nehoda with a slide-by, swooping in back for a late takedown and an important 6-2 win. Up next in the quarterfinals for LaMont was two-time Nordic Championships winner and this year’s Junior Euro silver medalist, Ardit Fazljija (SWE). The Utah Valley collegian started off with a beautiful headlock for a quick four, a good sign. However, Fazljija immediately reversed and transitioned into a gutwrench. The tempo looked like it could boil over for both wrestlers, but LaMont calmed things down once they reset. He pecked and clawed for tie-ups as Fazljija looked for his own opportunities. Neither was holding a distinct advantage in terms of energy and the remainder of the first period could best be defined as an impasse. In the conclusive frame, LaMont capitalized on a Fazljija front headlock attempt to snag two, widening the gap to 6-3. His work-rate ticked up a notch and Fazljija was starting to fade just a little. Coming off of an exchange, LaMont found leverage over the Swede and swooped behind for a takedown. There wasn’t a lot of fight left, leaving LaMont in the driver’s seat as he took this one all the way home, advancing to the semifinals on the heels of an 8-3 decision. 2015 Cadet World Champion Aleksander Hrushyn (UKR) derailed the march to gold. LaMont was awarded the first passivity point of the bout early on in the first and despite the Ukrainian’s eagerness for action, he controlled most of the exchanges. Hrushyn dipped levels occasionally along with banging inside for scoring chances, but it was LaMont who owned the tie-ups due to his overall reliance on strong positioning, though both athletes kept the heat on. The second period is when things went awry. Hrushyn got on the board with a passivity point, simultaneously taking over criteria. Soon after, he slid in on a high dive, getting around LaMont for two points before gutting him over for another pair. It was a quick turnaround with Hrushyn piling up five points in a hurry. LaMont tried to battle back and fight his way into scoring chances. To Hrushyn’s credit, he never stopped coming forward to press the action. A step-out on LaMont arrived towards the end of the match, making the final score 6-1 in favor of Hrushyn. LaMont is still alive for third place and will be going up against Russia’s Magomed Magomedov in the afternoon session. 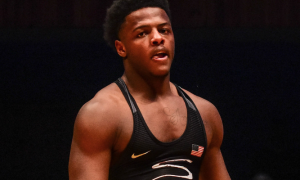 One of the most talked-about US wrestlers in this World Championships, G’Angelo Hancock (96 kg, Sunkist), entered the day a weight-class favorite. 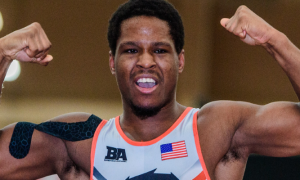 A bronze medalist in 2016, Hancock’s stock has steadily risen due to his sparkling success as both a Junior and Senior over the past year. Entering today, it was all a matter of staying on course. But what appeared like a promising mission to take the top spot on the medal stand unfortunately ended with a hard-luck loss. For his first match of the morning, Hancock faced off with Damion Von Euw of Switzerland. The pair jockeyed for tie-ups with Von Euw showing some energy. Hancock, a picture of calmness, patiently fought for inside wrists and short drags. No glaring windows were opening, but Hancock soon started to command the action after a warning for finger-grabbing came in. Eventually, Von Euw was knocked twice for passivity, giving the American a point. The static resumed. Hancock pressured forward and came in on Von Euw towards the edge, forcing him down and off the mat for a pair of points. Von Euw checked in for a point, making the score 3-1. Another step-out resulted in a caution-and-two on Switzerland — 5-1, Hancock. As the period began to wind down, Hancock got in and around Von Euw with a bodylock and torched it, resulting in four points and an emphatic 9-1 tech to kick off his day. For Kiril Mile Milov (BUL), Hancock worked with what has been largely responsible for his growth as a Greco wrestler — footwork, positioning, the ability to off-balance, and opportunistic aggression. It was evident right away that Hancock was going to assume control once the feeling-out process was through. He nudged his way in with an underhook, weaving it across while using his feet to disrupt Milov’s level of comfort. Although Hancock was the aggressor, it was he who was questionably dinged first with a passivity warning. The call was largely inconsequential because soon after, Milov attempted an arm throw that Hancock immediately snuffed out. He pinched around Milov’s head and arm and bulldogged him down and to his back for four to go along with a step-out point when the two scrambled up to their feet — 5-0 Hancock. A takedown increased the lead to 7-0. Hancock proceeded to put a bow on the bout with a two-point bodylock off the edge that Bulgaria challenged (and lost). 10-0 for Hancock as well as his second straight technical fall victory, sending him into the quarterfinals. 2017 Junior European Championships silver medalist Suleyman Erbay (TUR) stood between Hancock and a guaranteed chance at a medal of any color. The Turkish wrestler jumped out in front when he countered a Hancock attempt to roll on top for two points. After the reset, Erbay went for an arm throw and similar to how Hancock stopped Milov’s own try at the move, he locked around — though this time, he only yielded two. Hancock carried a criteria lead into the second. For a while, this was a tactical yet brutal contest. Both wrestlers punished each other with busy inside work even though actual scoring chances were hard to come by. Hancock found space later on and used it to his advantage by bullying Erbay out of bounds for a point and a 3-2 lead. The action was tight and the score was close, but were looking good for Hancock into the final minute. That’s when it all unraveled for the American. As they broke apart off a tie-up, Hancock pivoted in and lost his balance for a brief second, essentially tripping to the mat. Erbay pounced and covered for two to climb out in front 4-3. Only :40 remained. Hancock gave it all he had, clashing in repeatedly, reaching for bodylocks, whatever he could do to somehow see this through. He had run out of time. Erbay came away with the 4-3 win but was turned back in the semis by Artur Sargsian (RUS), ending Hancock’s bid for not only a gold, but a medal altogether. The medal rounds begin at 6:00pm local time (11:00am EST). We will have live coverage all day long on Twitter along with a final recap following the day’s action. Streaming available in the US on Trackwrestling.com.